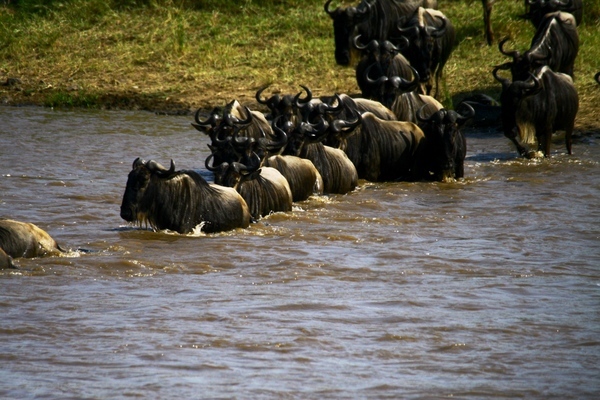 The annual migration of the wildebeest represents the single largest movement of wildlife on planet earth. Dramatic, awe-inspiring, comic and tragic alike, it has been dubbed ‘The Eighth Wonder of the Natural World’ and the ‘Greatest Wildlife Show on Earth.’ Neither title does full justice to the enormity and grandeur of an event that sees multiple herds of 20,000 and more wildebeest careering across the glory of the African savannah in great galloping chains of blue-black creatures. An ever-revolving cycle of birth, life and death, the 800 km path of the migration is dictated by the hunt for fresh grass and consequently covers both the Serengeti National Reserve of Tanzania and the Masai Mara National Reserve of Kenya. For this, exceptionally focussed safari, however, our progress is dictated by the movement of the migration itself. As a result, we follow over a million wildebeest, half a million zebra and an accompanying cast of predators through some uniquely different eco-spheres. Firstly, we travel through the enchanted realm of Tarangire National Park to stay on a Maasai ranch where sugar-pink flamingos fringe the lakeside. Next we journey down into the vast basin of the world-famous Ngorongoro Crater, where we stay in a stone-built lodge that clings high on the very crater’s rim. Finally, having taken in a visit to the birthplace of mankind at Ol Duvai Gorge, we arrive on the endless plains of the Serengeti, where we spend six glorious days in the exploration of this vast yet uniquely diverse wilderness arena. 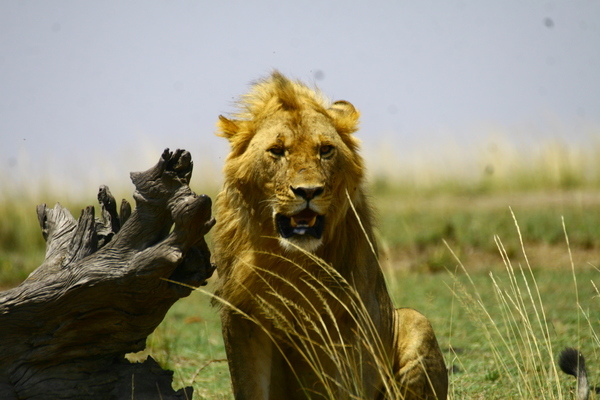 Thereafter, the direction the safari takes depends on the time of year at which you join us. If you arrive in February, then we will follow the herds south to witness the extraordinary spectacle of the calving in the south of the Serengeti National Reserve. 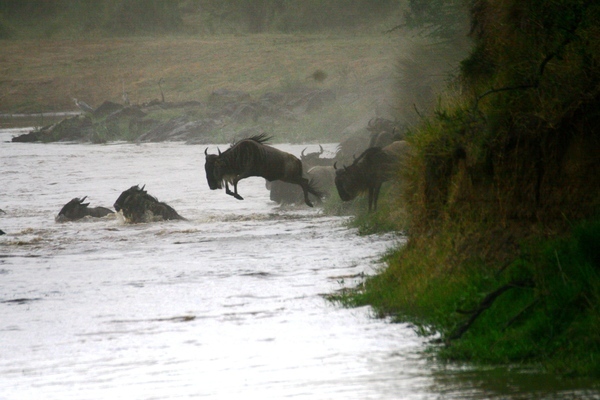 If you arrive in September, we travel north to follow the herds as they plunge across the Mara River. 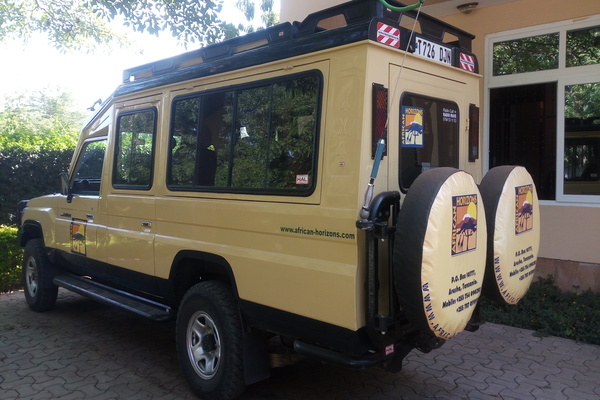 In either case, this safari travels by road and is accompanied by professional guides of the highest proficiency. After breakfast, drive to the Tarangire and arrive at the Maramboi Tented Camp which is situated on a 25,000 hectare Maasai communal ranch. During the wet season the ‘pans’ (shallow depressions) of this area fill with water, which attracts huge flocks of flamingos and other water birds. The camp is also ideally placed for watching the migration of the wildebeest, which on the tree-less plains can be more easily and more graphically observed than elsewhere. The camp offers 20 spacious tents, all surrounded by timber decks. 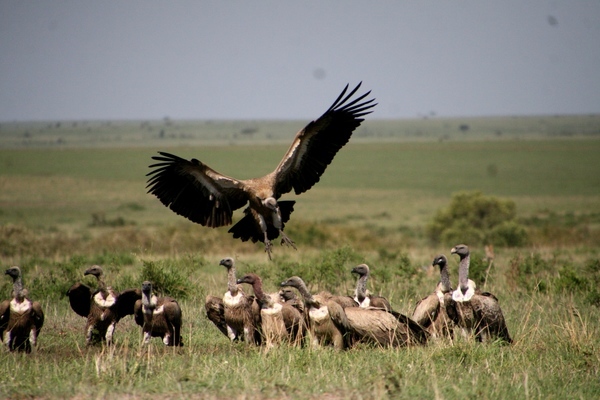 Activities possible at an extra cost while at the camp include guided walks, ornithology and cultural interaction with the Datoga and Maasai people, whose communities live adjacent to the camp. The camp also has its own swimming pool. 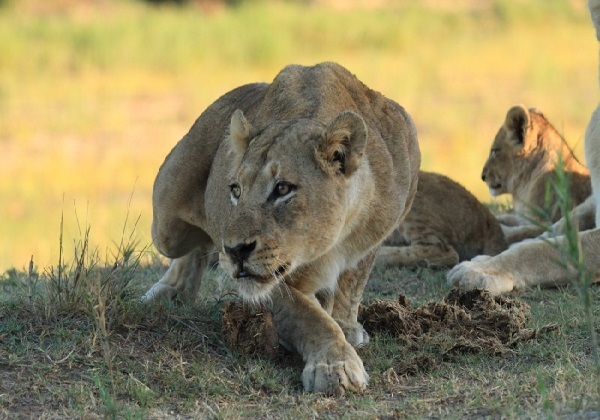 Early lunch and in the afternoon take a game-drive through the Tarangire National Park, which is second only to the Ngorongoro Crater as a dry-season sanctuary for vast herds of migratory creatures. Dinner at the camp. 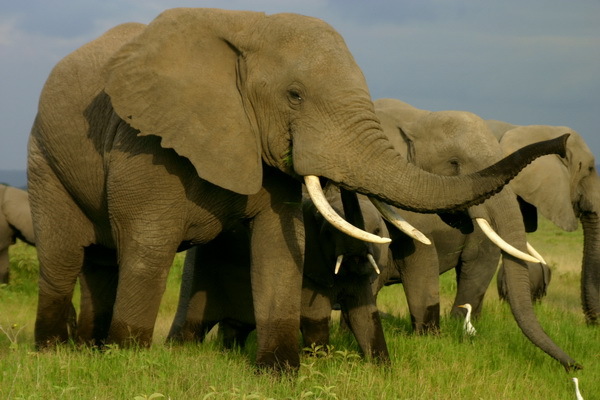 After breakfast, depart and drive to the Ngorongoro Crater Conservation Area often referred to as ‘the eighth wonder of the world’ the Ngorongoro Crater is one of Africa’s best-known wildlife arenas. A World Heritage Site, it is also one of the largest volcanic craters in the world (almost 20 kilometres wide, 610-760 metres deep and covering a total area of 264 square kilometres). An utterly unique biosphere, the Crater harbours grasslands, swamps, forests, saltpans, a fresh water lake and a glorious variety of birdlife, all enclosed within its towering walls. Descent straight down the crater which offers one of the finest locations of all the crater-rim lodges, lying on its southern rim directly above the yellow fever trees of the Lerai Forest. Enjoy an afternoon game drive with picnic lunch on the crater floor, until sunset when you ascend and proceed for check in at your lodge. After breakfast depart and drive via the Olduvai Gorge, one of the World’s most important Paleolithic sites. 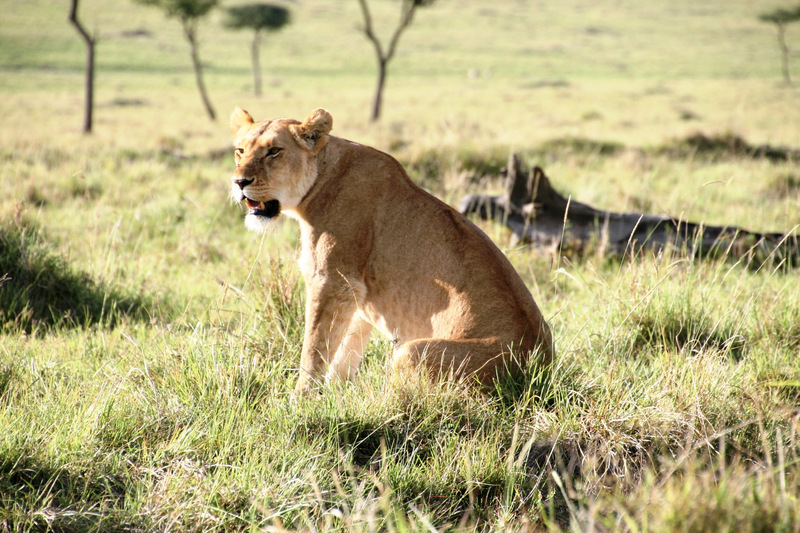 Proceed to the Serengeti to check in for lunch at your camp. 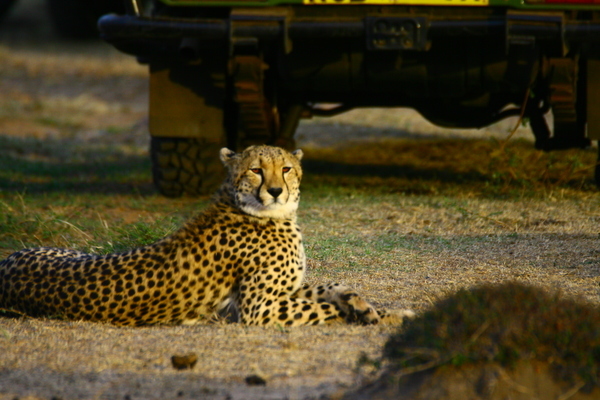 Thereafter enjoy an afternoon game drive until sunset time to return for dinner and overnight at the camp. After the first phase of our experience in the central Serengeti, we move to the Ndutu and Northern Serengeti areas in February and September respectively as we explore these migration spots for chances with the best experiences of part of the greater migration. After breakfast, you will be transferred to the local airstrip for an included scheduled domestic flight to Kilimanjaro International Airport where you will connect to your onward international flight. During this all year round phenomena, over one and a half million wildebeest accompanied by half again as many zebras and gazelles, migrate from the short-grass plains of the Serengeti to fresh pasture in the grasslands of the Mara; thus creating one of nature’s grandest spectacles. 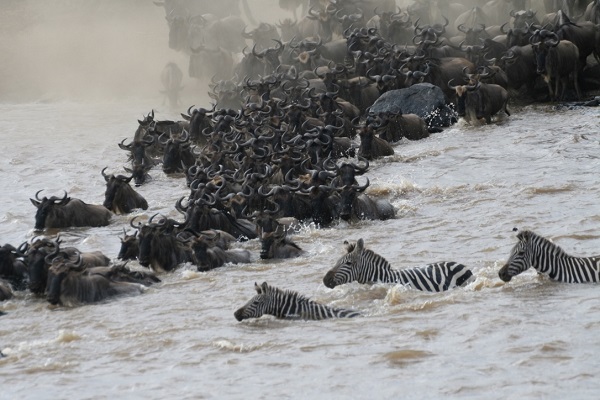 Moving in groups of up to 20,000 at a time they thunder across the plateau hesitating only briefly to cross the Mara River, where many fall prey to the waiting crocodiles. Towards the end of October they begin crossing back into Tanzania. The actual timing of the migration, however, is dictated by the weather and does not always run to schedule. Wildlife Highlights: wildebeest, lion, elephant, buffalo, leopard, cheetah, hippos, crocodiles, zebra, antelope, gazelle, impala, waterbuck, topi, eland, plains game, giraffe, black and white rhino.